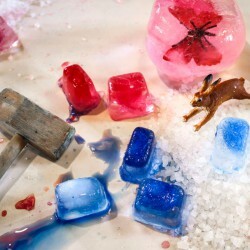 Find the best way to excavate frozen objects! Using a variety of tools, try to get items out of blocks of ice. This activity helps children learn problem solving skills and persistence. Hints for uses in your library This activity is a favorite for use in library settings because it: is fun and different; uses inexpensive supplies; can be used with varied ages, families and group sizes; and works if participants arrive at different times. Originating Source This activity was contributed by the Center for Childhood Creativity at the Bay Area Discovery Museum. ©2015 Bay Area Discovery Museum. For more information and resources see CenterforChildhoodCreativity.org.